The reality is that servers drive the Internet, as well as most corporate networks. The two big players in the server operating system space are Microsoft and Linux. Yes Google is taking over how user connect to the internet, with mobile devices, phones and pads, out selling desktops in the last three months of 2012. Even at Seczine.com we are seeing a significant growth in users connecting from non desktop devices, with the current balance around 50/50. But they all still connect back to a server running web applications, such as web servers, database servers and payment platforms. Microsoft still rules the server market in the corporate sector, although Linux is killing it on the Internet. Microsoft has a new version of the Windows server on the market, 2012. Windows Server 2012 is Microsoft’s pitch at a cloud operating system. It is very big on virtualisation, with Hyper-V3 coming free with the Hyper-V Server install. This includes the cool feature of being able to instigate a live migration of virtual machines, including the storage, to a new host. Speaking of storage there is a new file system, the Resilient File System (ReFS), which allows automatic backups, this file system also allows the dynamic addition of disks to volumes to add space when you start to run low. For those worried about data protection there is Dynamic Access Control which allows you to limit a user to read access only, meaning they could not copy or print a file. The remote management interface has also been significantly improved. All these new features leads to a slight problem, how do we learn about them? 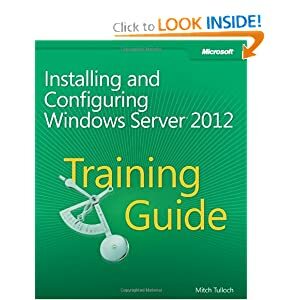 Well you can attend a $1,500 five day Windows 2012 course, or you can the best book in the market on Windows Server 2012. So I thought I would help you out here. Having a large project on the horizon, and already being MCSE certified, I needed to jump head first in to the Windows Server 2012 books market and find the best. The best two books I came across, out of seven I brought (technically the company brought, but still a lot cheaper than sending me on a $1500 course!) were Training Guide: Installing and Configuring Windows Server 2012 and Windows Server 2012 Pocket Consultant. I found the training guide was a really quick way to get the product installed and configured. I had three servers so tried a number of different installs including a Hyper-V install. I learn a lot by playing, so once installed and up and running I was able to experiment with Windows 2012. The guide also had the added advantage of being targeted at the Microsoft Exam 70-410, so I can use it when I plan to upgrade my qualifications. 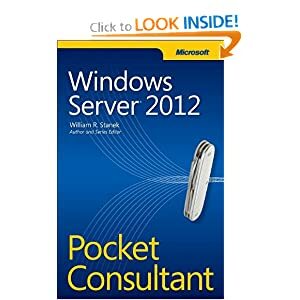 But when I was looking for more in-depth under the hood information I needed the Windows Server 2012 Pocket Consultant. The Pocket Consultant was not my go to book; a first, the first book I always look up when a new product or version hits the market is the Unleashed series, in this case Windows Server 2012 Unleashed. But this time the boys over at Unleashed dropped the ball, it felt like they rushed it to market. But where one leader crashes and burns another rises from the ashes, The Pocket Consultant nailed it. All of the new features were covered, in great detail; I particularly liked the section on the new file system and the back-up and recovery section. That might have more to do with the fact that the project I was working on had these features as a major requirement. All of the critical topics were covered, Active Directory, New Users, Groups, Printers and management tasks. Once you have it installed and configured you can’t go wrong with The Pocket Consultant.